Facts and information about the History of Clothing and regalia of Native American Indians and the War Bonnet. The authentic and traditional feather War Bonnet was favored by the chiefs, war leaders and warriors of many tribes who inhabited the Great Plains including the Cheyenne, Sioux, Assiniboine and Chippewa. 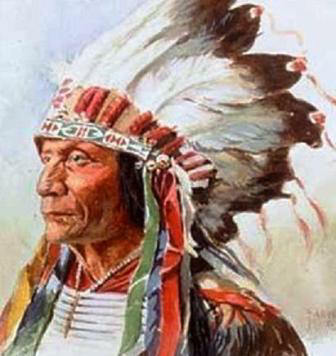 Every one of the feathers in the war bonnet headdress was a symbolic reflection of the brave deeds and battles that the warrior had been engaged in. The war bonnet was a symbol of high respect and a visible display of a warrior's bravery, honor and standing in his tribe.